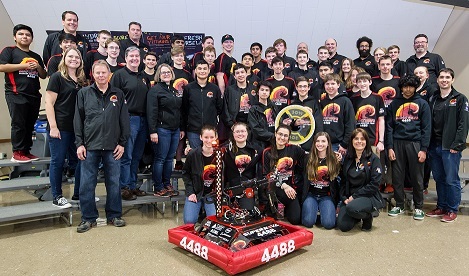 FIRST Deep Space, is the FIRST Robotics Competition game for the 2019 season. 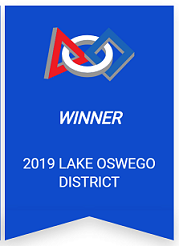 As in past games, two alliances of three individual teams and their robots compete on a field to score "match" points to win the game, and ranking points to advance to playoff rounds. The game has a space theme and teams are required to place playground balls which represent cargo into a simulated one-level cargo ship and three-level rocketship on the side of the of the field. Each cargo space must be secured with a panel to hold the cargo in place. The game begins with a sandstorm where drivers have no vision of the field for 15 seconds. The robots are able to operate autonomously or via camera. Each alliance has one rocket and one cargo hold to fill with cargo and panels from the field and human players. At the end of the match, robots return to the multi-level base, earning additional points for every level they reach before time runs out. This season was possible thanks to our wonderful sponsors, partners, and friends.